Class: Junior Hometown: Belle Vernon, Pa.
NOTES: Three-year letterwinner and part time starter on the wing... 2015: Appeared in 16 matches, making five starts ... 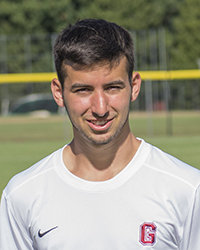 Scored Grove City's lone goal against Geneva ... 2014: Appeared in all 21 matches, making 11 starts... Tied for second on the team with four assists... Fourth on the team with 10 points... Scored what would prove to be the game-winner at Oberlin... Assisted on the game-winning goal in 2OT in Wolverines' PAC Semifinal win over Waynesburg... 2013: Saw action in nine matches before suffering a season-ending injury... Opening-day starter against Frostburg State... Netted two goals, including the game-winner, in win at Hilbert... Added an assist against Heidelberg.